Today something healthy. Lovely Jackie teaches us how to make a delicious, fresh-tasting Vietnamese chicken salad with fish sauce dressing and crushed peanuts on top. 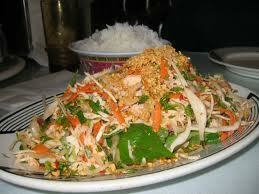 In Vietnam, this salad is called "Goi Ga".